The mostly true adventures of a 30-something lawyer gallivanting around the world. 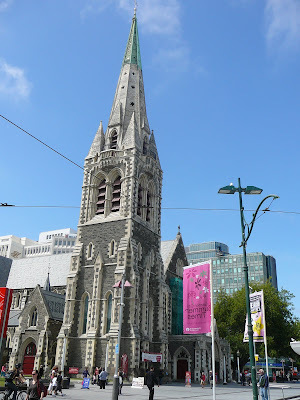 After leaving Kaikoura, we continued by train to Christchurch, New Zealand. The landscape was beautiful -- coastline receding into farmland. 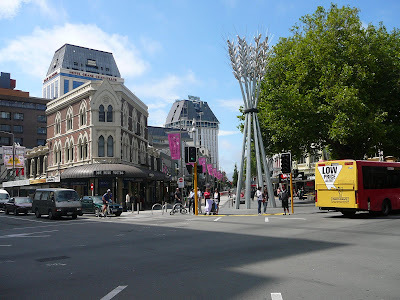 We had planned to spend a few days in Christchurch, but the outfitter we had planned to go whitewater rafting with let us know they would need to pick us up a few days earlier than expected, so we really only had one day in Christchurch. This turned out not to be a problem, as we found we were able to see (or too poor to see) everything worth seeing in less than 24 hours. 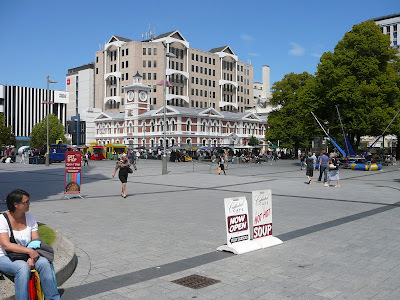 It took us about 4 or 5-hours (by train) to get to Christchurch, where we disembarked and made our way to our backpackers. It was called “Jailhouse Accommodation,” and that’s exactly what it was: a defunct prison. Our room was a cell (though the bars had been replaced with a heavy iron door (or the door was always there, not sure)). The inside of the place looked like the prison from the movie “The Green Mile.“ While this was somewhat entertaining, it was also kind of creepy. Plus, this hostel was so remote from any services travelers might need, that we spent about 45 minutes walking to a grocery store, and another 45 back. This is quite far to walk when you’re hungry and mostly through an industrial area. Also, since it was after 5:30 p.m., everything was closed (in NZ, everything closes “late,” which means at 5:30 p.m.). Anyhow, the next day, we walked from the prison through a beautiful park (forget the name). Christchurch is very British. 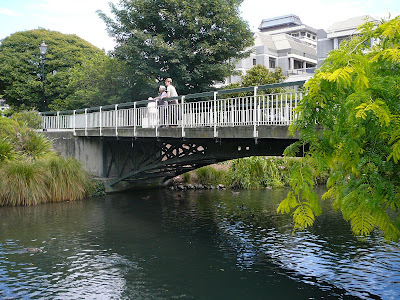 They have a beautiful, though small, river called the Avon (I think) that winds through the city. 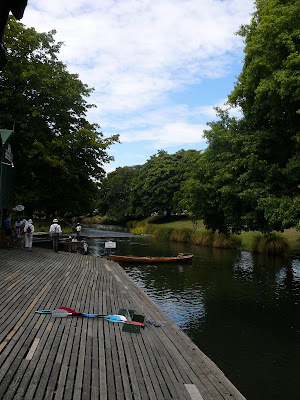 There were little punts taking people for rides up and down the river. 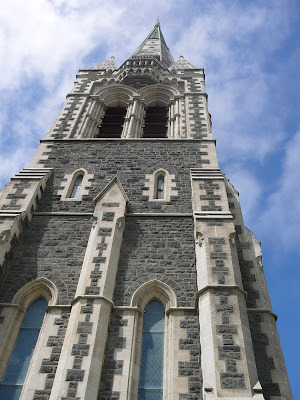 There’s also a nice cathedral. We wandered through the downtown in the morning, ate some lunch, and went shopping. 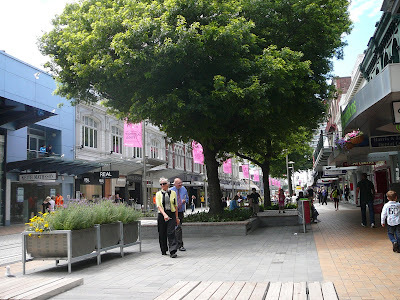 (By the by, if you are in the market for clothes, do not go to NZ to buy them. Clothes there are ridiculously overpriced. Literally, $90NZ for a t-shirt. Seriously. This is not one of those times when I’m exaggerating, as I recognize I am wont to sometimes do. No, a T-shirt costs about $70US. A shirt-shirt will run you a good $120NZ. Re-donk-u-lous.) There were several street performers in the main square, whom I think were arriving for an international street busker festival that Christchurch hosts yearly which was to start in a few days’ time. In the later afternoon, we went back to the hostel to meet the owner of the rafting company for a three hour ride further inland. More on the ride and the rafting later. Lovely pictures! Why are shirts so expensive? That is odd, for sure. Thanks! The pricing thing is weird. Maybe it's because stuff has to be imported? Don't know.